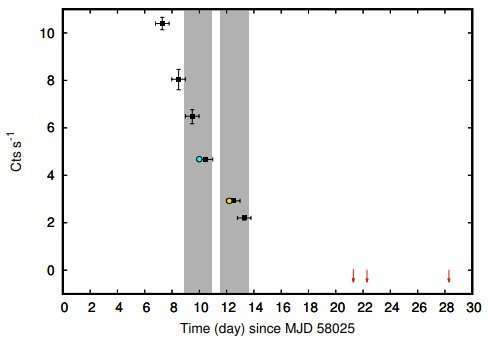 Background subtracted 0.3–10 keV Swift-XRT lightcurve (starting from the beginning of the outburst as reported by MAXI), where red arrows are 3σ upper limits; the XMM-Newton and NuSTAR observations have been taken at MJD 58035 (cyan circle) and 58037 (orange circle), respectively. INTEGRAL observations were taken in the epochs inside the grey boxes. Credit: Pintore et al., 2018. European astronomers have spotted a new outburst of the accreting millisecond X-ray pulsar designated SAX J1748.9-2021. The outburst, which started on September 29, 2017, is fainter and shorter than previous outbursts of this pulsar. The discovery is reported in a paper published June 28 on arXiv.org. Millisecond pulsars are neutron stars that rotate hundreds of times per second. They play an important role in understanding the evolution of neutron stars and the equation of states of condensed matter, and can also be used to detect low-frequency gravitational waves. Accreting millisecond X-ray pulsars (AMXP) are a peculiar type of X-ray pulsars in which short spin periods are caused by long-lasting mass transfer from a low-mass companion star through an accretion disc onto a slow-rotating neutron star. They are perceived by the scientific community as astrophysical laboratories that could be essential to our understanding of thermonuclear burst processes. To date, only 21 AMXPs have been detected. One of them is SAX J1748.9-2021 located in the globular cluster NGC 6440, some 28,000 light years away from the Earth. It was discovered in 1998 by the BeppoSAX X-ray astronomy satellite, during its first recorded outburst. Subsequent outbursts occurred in 2001, 2005, 2010 and 2015. Now, a team of astronomers led by Fabio Pintore of the Institute of Space Astrophysics and Cosmic Physics in Milan, Italy, has detected the sixth outburst of this pulsar. The detection was made using the Monitor of All-sky X-ray Image (MAXI) onboard the International Space Station. Follow-up observations of this event were conducted with NASA's Swift and NuSTAR spacecraft, together with ESA's INTEGRAL and XMM-Newton space telescopes. "In 2017, SAX J1748.9-2021 underwent its sixth outburst. The event was firstly detected by MAXI/GSC on September 29 and then observed by Swift/XRT, INTEGRAL, XMM-Newton and NuSTAR," the researchers wrote in the paper. Observations carried out by Pintore's team show that the newly observed outburst lasted about 13 days and showcased an exponential decay with e-folding decay time of approximately four days. Lightcurve obtained by MAXI indicates that the pulsar reached the peak of the outburst between October 4 and 5. According to the study, the 2017 outburst reached a 0.3–70 keV unabsorbed peak luminosity of around 3.0 undecillion erg/s. This is the weakest outburst out of all such events recorded so far. Moreover, it is also the shortest outburst to date as previous explosions lasted usually about 30 days. Furthermore, the researchers found that spectral properties of SAX J1748.9-2021 determined by recent observations, including an electron temperature of about 20 keV, a photon index of approximately 1.6–1.7 keV and seed photon temperature of 0.44 keV, suggest that the pulsar was observed in the so-called "hard" state. This state is characterized by the combination of a thermal soft component (temperatures below 2 keV), a dominating Comptonizating component with electrons in an optically thin hot plasma with temperatures between 20 and 50 keV, and in some cases of a third thermal continuum component likely produced by the surface of a neutron star. SAX J1748.9-2021 is an accreting X-ray millisecond pulsar observed in outburst five times since its discovery in 1998. In early October 2017, the source started its sixth outburst, which lasted only ~13 days, significantly shorter than the typical 30 days duration of the previous outbursts. It reached a 0.3-70 keV unabsorbed peak luminosity of ∼3×1036 erg/s. This is the weakest outburst ever reported for this source to date. We analyzed almost simultaneous XMM-Newton, NuSTAR and INTEGRAL observations taken during the decaying phase of its 2017 outburst. We found that the spectral properties of SAX J1748.9-2021 are consistent with an absorbed Comptonization plus a blackbody component. The former, characterized by an electron temperature of ~20 keV, a photon index of ~1.6-1.7 keV and seed photon temperature of 0.44 keV, can be associated to a hot corona or the accretion column, while the latter is more likely originating from the neutron star surface (kTbb∼0.6 keV, Rbb∼2.5 km). These findings suggest that SAX J1748.9-2021 was observed in a hard spectral state, as it is typically the case for accreting millisecond pulsars in outburst.